Annealed Copper 58.0 × 106 20 Referred to as 100% IACS or International Annealed Copper Standard. 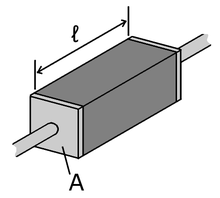 The unit for expressing the conductivity of nonmagnetic materials by testing using the eddy-current method. Generally used for temper and alloy verification of Aluminium. सोना 45.2 × 106 20 Gold is commonly used in electrical contacts because it does not easily corrode. समुद्र का जल 4.788 20 Refer to http://www.kayelaby.npl.co.uk/general_physics/2_7/2_7_9.html for more detail as there are many variations and significant variables for seawater. ↑ अ आ See J. Phys. Chem. B 2005, 109, 1231-1238 In particular page 1235. Note that values in this paper are given in S/cm, not S/m, which differs by a factor of 100.